Happy Easter everyone!! 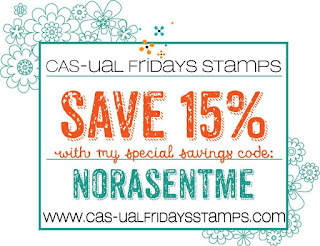 It is Nora here today on the blog. 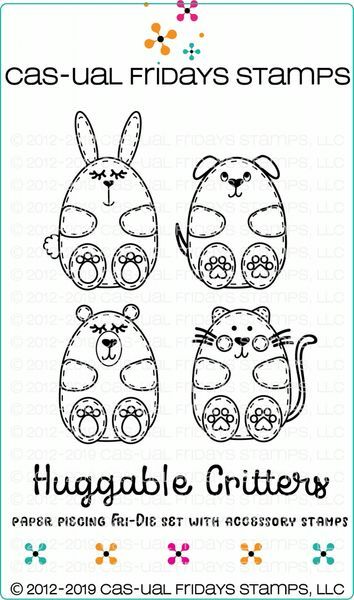 You would think that I would have created an Easter card today BUT I thought that would be too traditional! 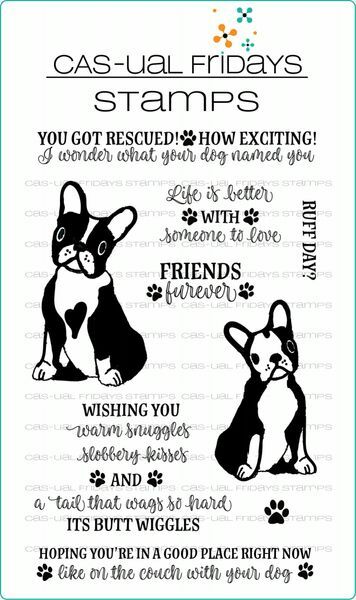 I decided to create a birthday card instead!! 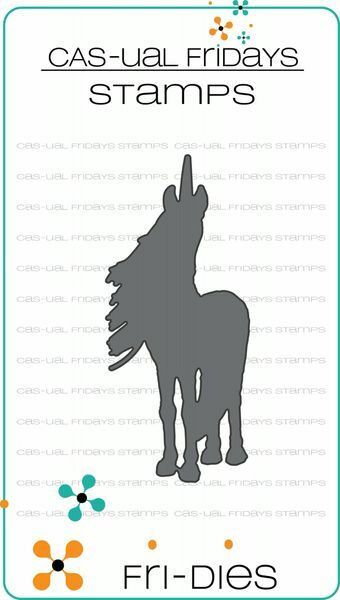 I started off this card by stamping and die cutting the Unicorn from the stamp set. I then used Copic Markers to color it in. I then covered the mane and the tail with Diamond Stickles and set it aside to dry. 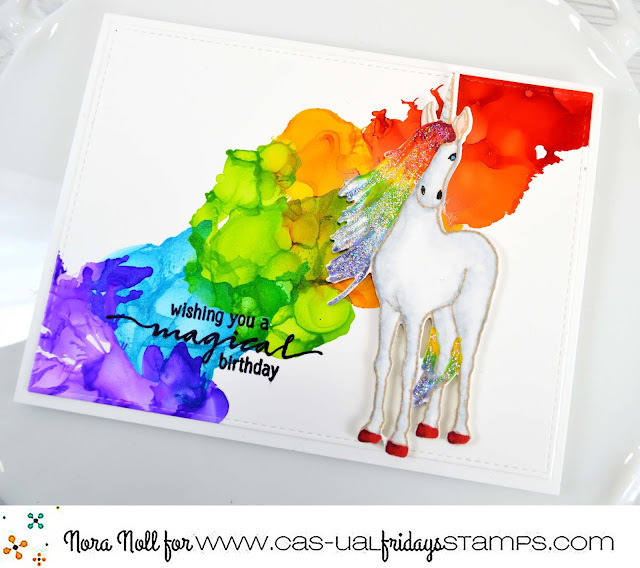 While the image was drying, I die cut a piece of Yupo paper and used alcohol ink in regular and pearl to create a rainbow background. This was SO FUN and very quick to do. I don't spend hours working it like others do but I think it came out fantastic. 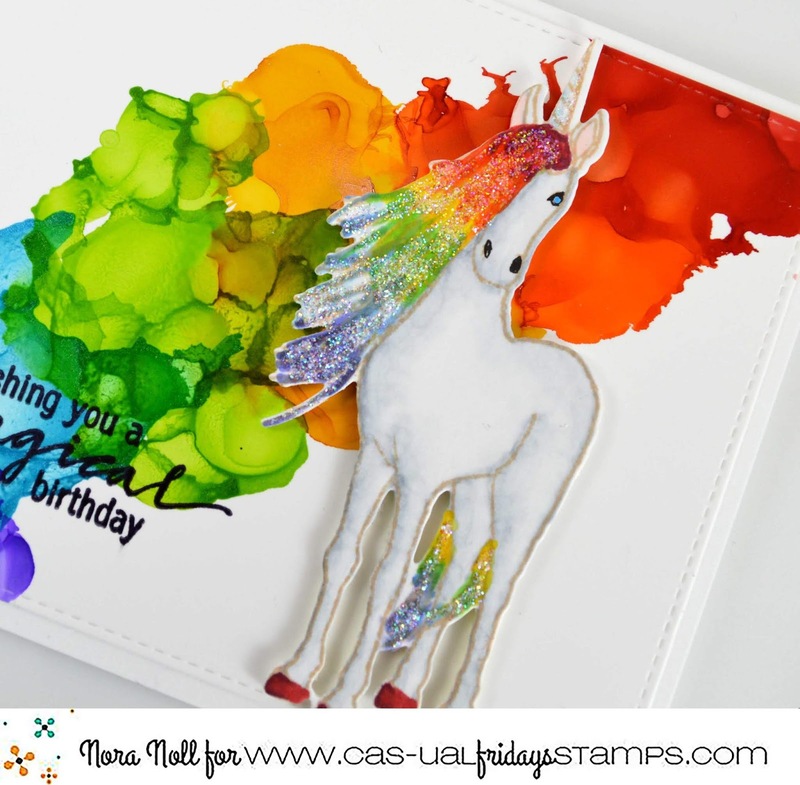 I then stamped the sentiment from the Be A Unicorn stamp set in an alcohol safe, black ink and mounted the card front on a 5 1/2" by 4 1/4" white card base. My last step was to use foam adhesive to pop the unicorn up over the rainbow. 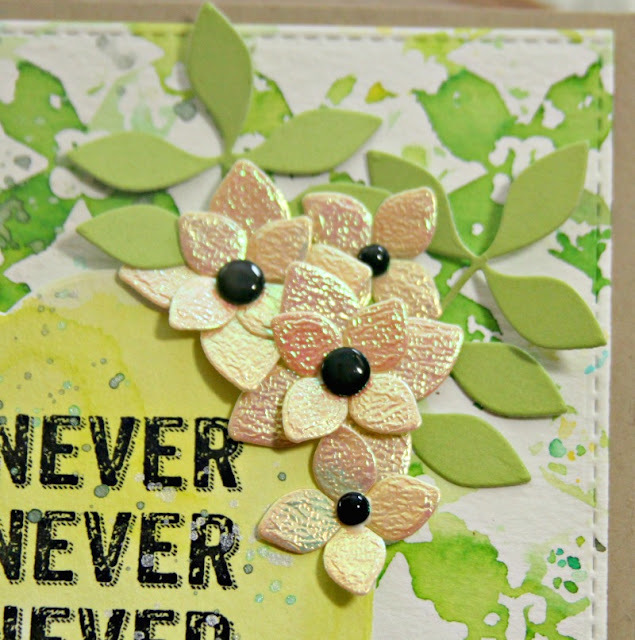 This was a really quick and easy card to create and it looks like it took a ton of time. 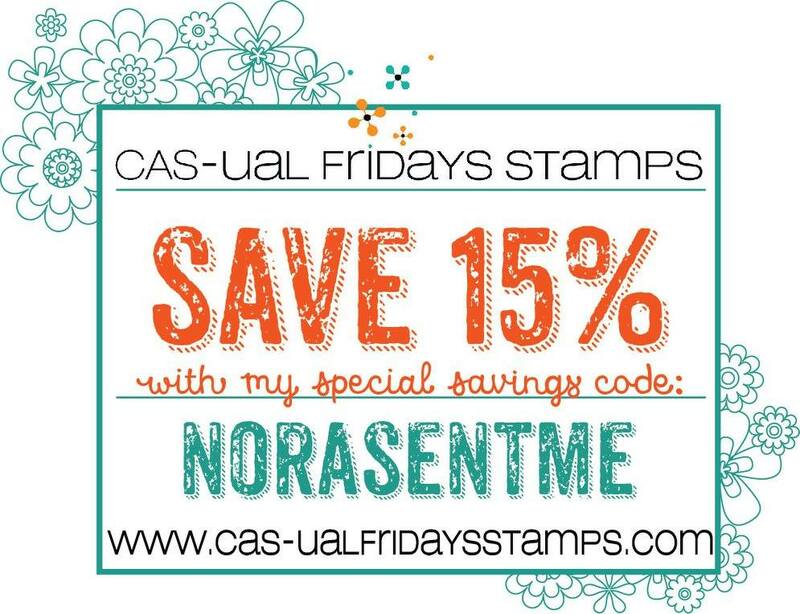 If you feel like getting yourself an Easter present, use my code NORASENTME to get 15% off your total purchase at the CAS-ual Fridays Store! That is it for me today. 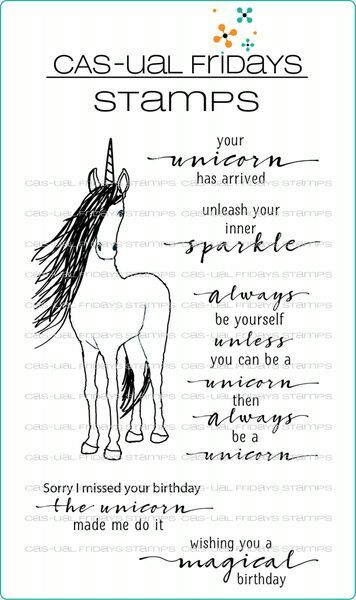 I hope you all have a FABULOUS day!! Lisa here! Today I'm sharing with you a technique I used quite a bit during the new release with Ken Oliver Color Bursts and some of the new stencils available in the shop! 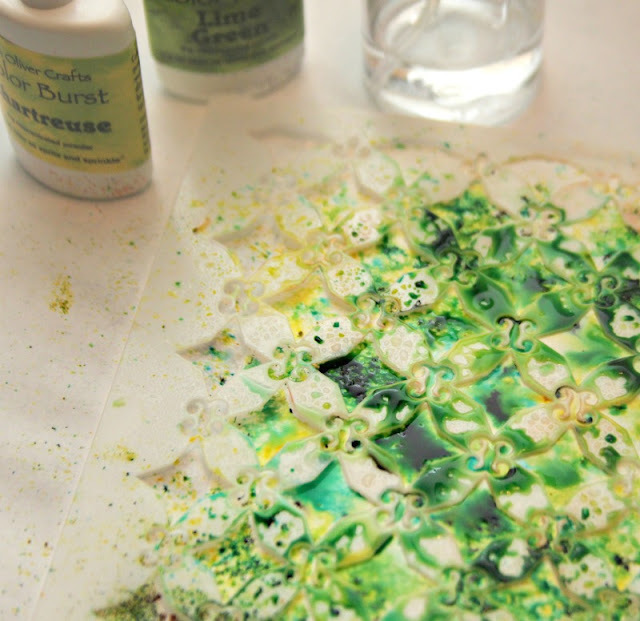 I cut the Bubble Box die out of some water color paper and used a bit of the Chartreuse powder to watercolor it. 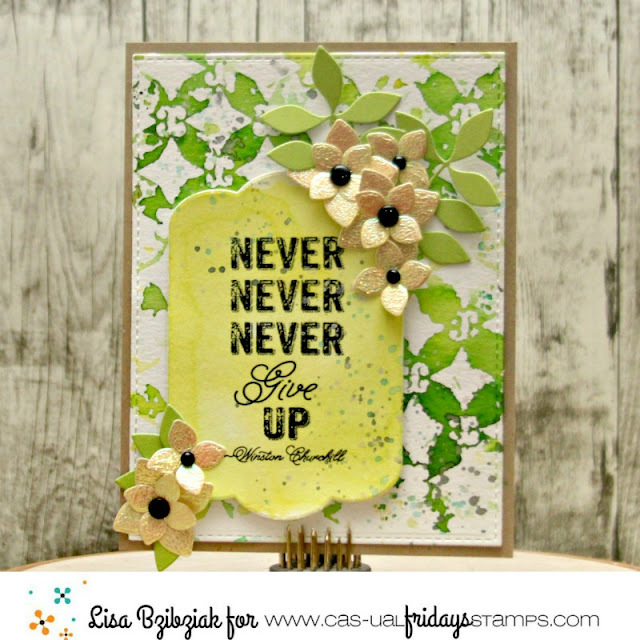 I'm impatient so I used a heat gun to dry this piece so I could stamp it with that inspirational sentiment from the Dream Then Do stamp set! 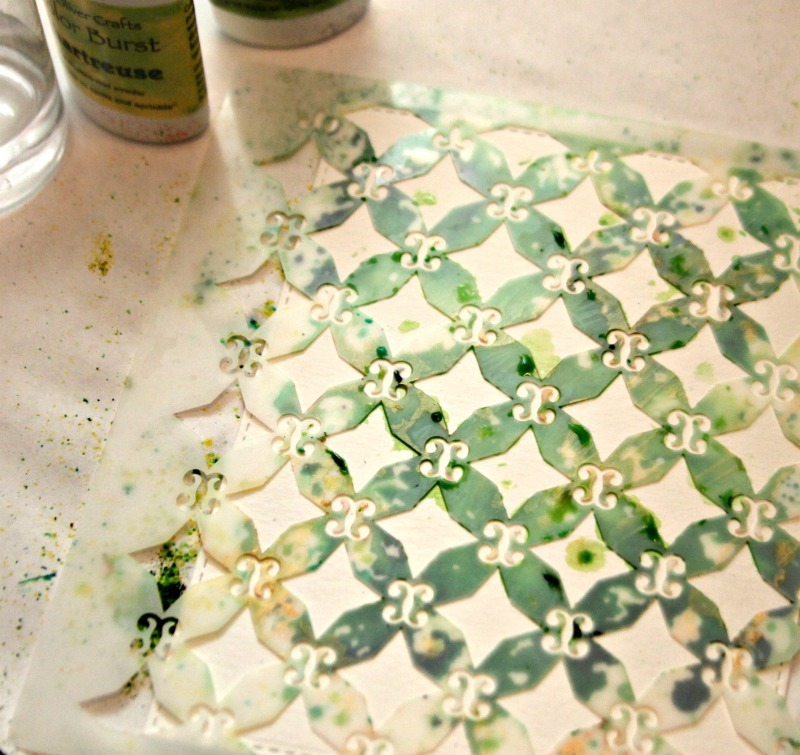 I popped it up and splattered a bit of shimmery watercolor over the top. 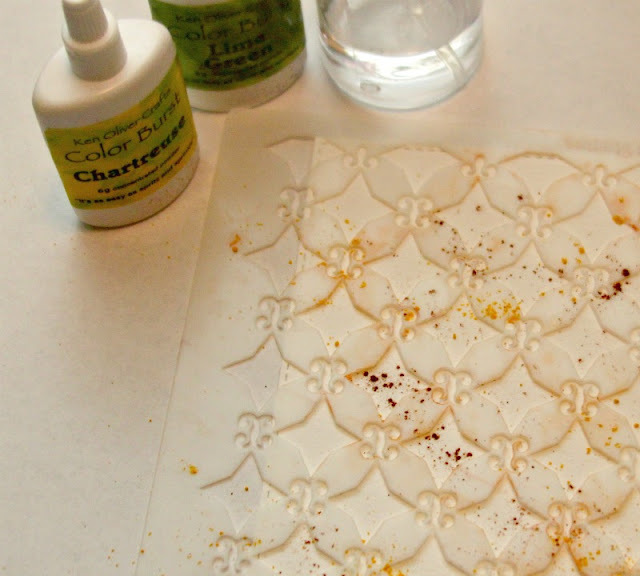 I cut some leaves from the Garden Fri-Dies from green cardstock and cut some yellow flowers from some yellow Sparkling Sheets with the 4 Petals Fri-Dies. Larissa here today with a SWEET Mother's Day Shaker Gift Bag!! I CAN'T believe how FAST the time is flying is by, April is almost half over, which means Mother's Day is just a Month away!! This Lil' Shaker Gift Bag is SURE to make someone SPECIAL Smile!! 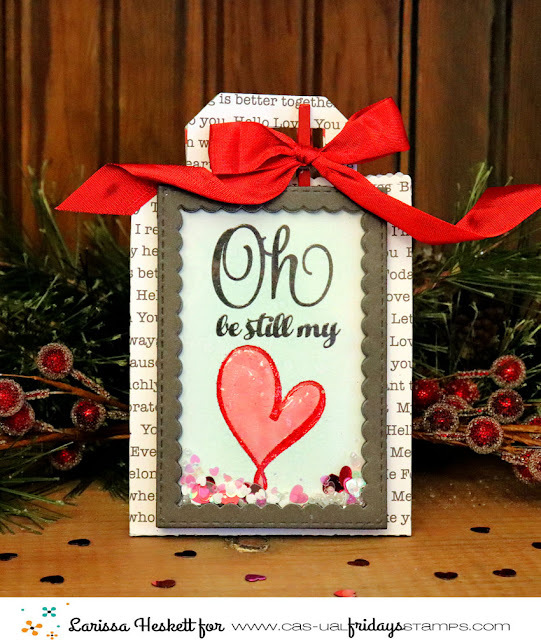 I used the Puffy Heart Love Stamp Set to create the inside of my Shaker Element!! 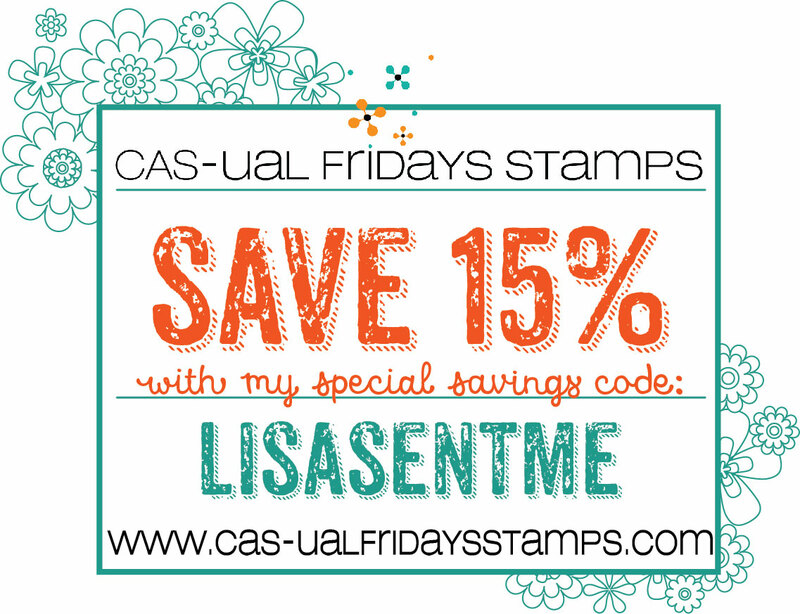 I Stamped and Embossed the Sentiment using Versa Fine Black Onyx Ink!! 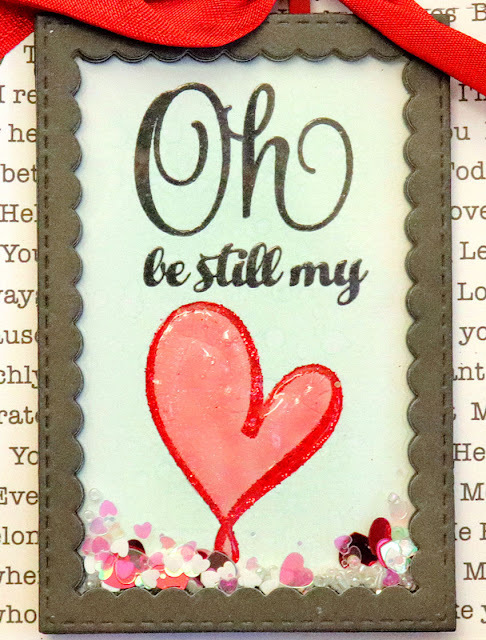 I used WoW Glitter Embossing Powder in Red for the Heart and then used a Red Nuvo Glitter Pen to color in the Heart and added a Coat of Morning Dew Nuvo Drops to cover the entire Heart!! I sat it aside to Dry!! Then I created a Scalloped Frame for the Shaker Window!! 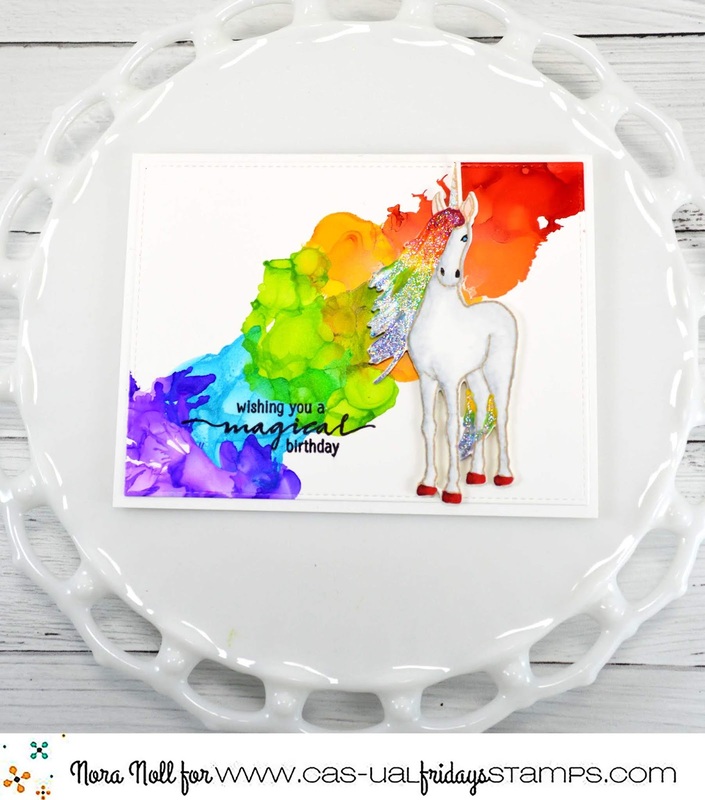 I added LOTS of Pretty Sequins and Confetti to make it even MORE FUN!! 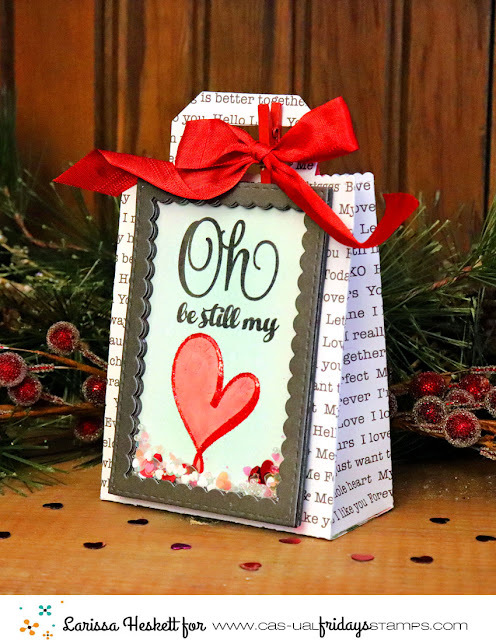 I added it to a Gift Bag and added a Red Seam Binding Ribbon to finish off the Design!! THANKS SO MUCH for stopping by today!! I hope I've given you some Ideas for those Mother's Day Gift Bags you might need to make!! Have a FABULOUS EASTER WEEK/WEEKEND!! Hello CAS-ual Fridays fans! 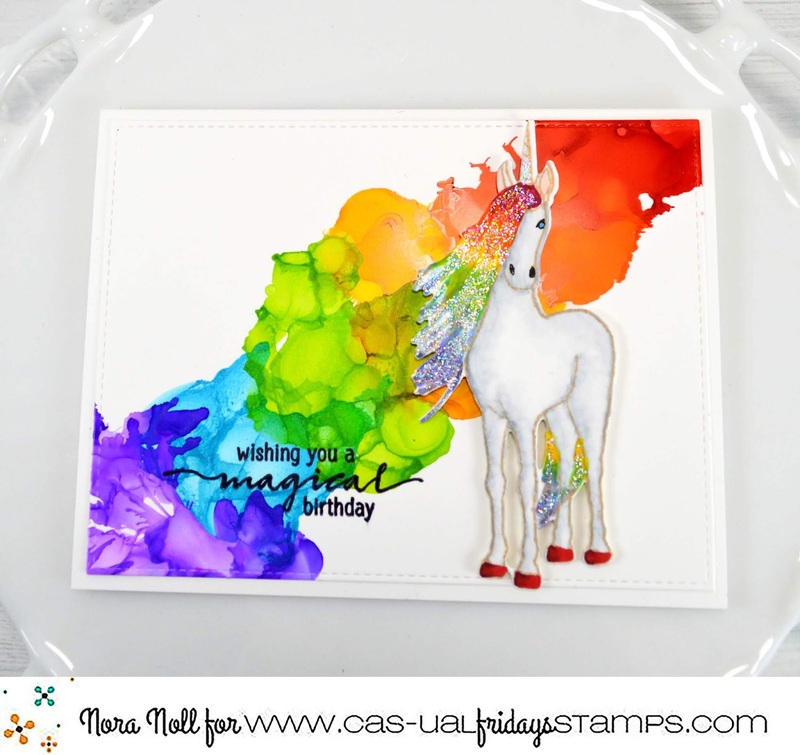 Maria here on the blog with you today. I am so sad to say that this is going to be my last post as a member of the Ink squad. 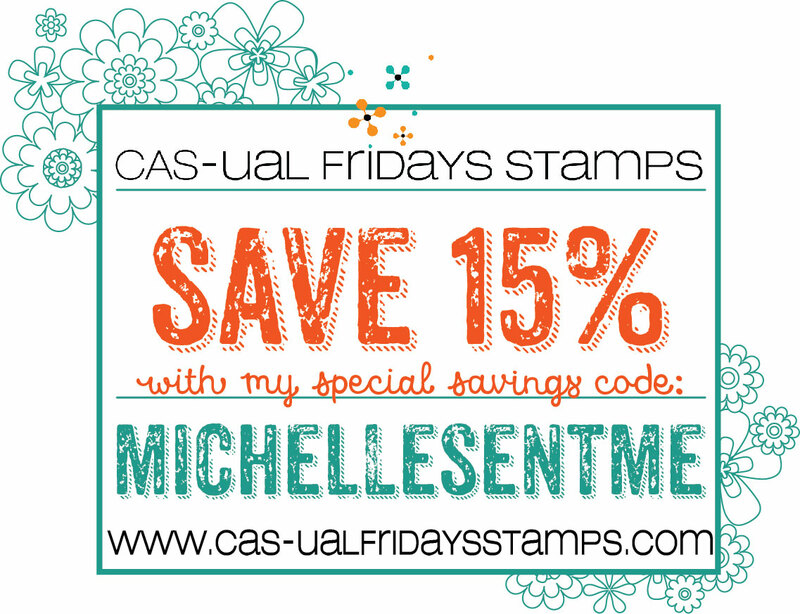 Being on this team has made me a better designer and having Michele Gross as our lady boss, wow! I can't even stop the tears as I'm writing this. Michele is the best ever and the girls on this team are simply sweet and amazing! I could never ask for a better team! 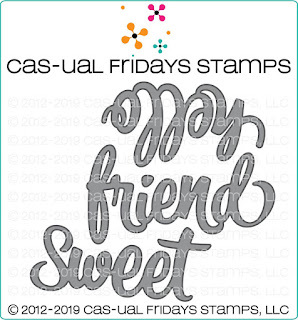 Sadly, my schedule has gone a bit awry but I will continue to promote CAS-ual Fridays and if you follow my blog or instagram, you will still see these projects. die-cut the "Hello" from the Sweet Friend Fri-dies on some black card stock. 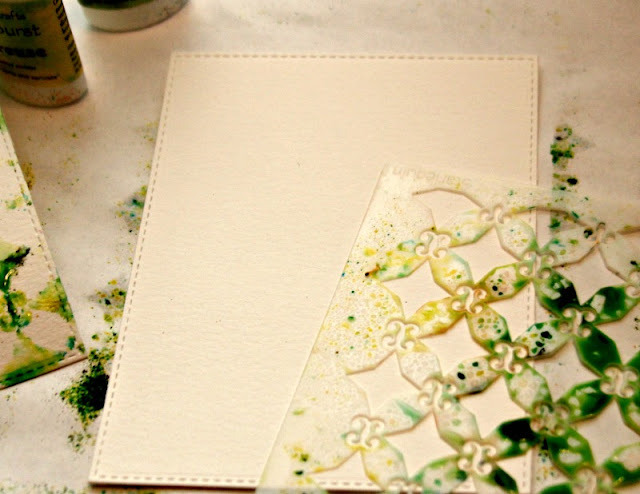 To finish my design, I used my Sakura white gel pen to add some lines and dots to the "Hello" sentiment. I hope you like my card and got inspired to create something beautiful today! 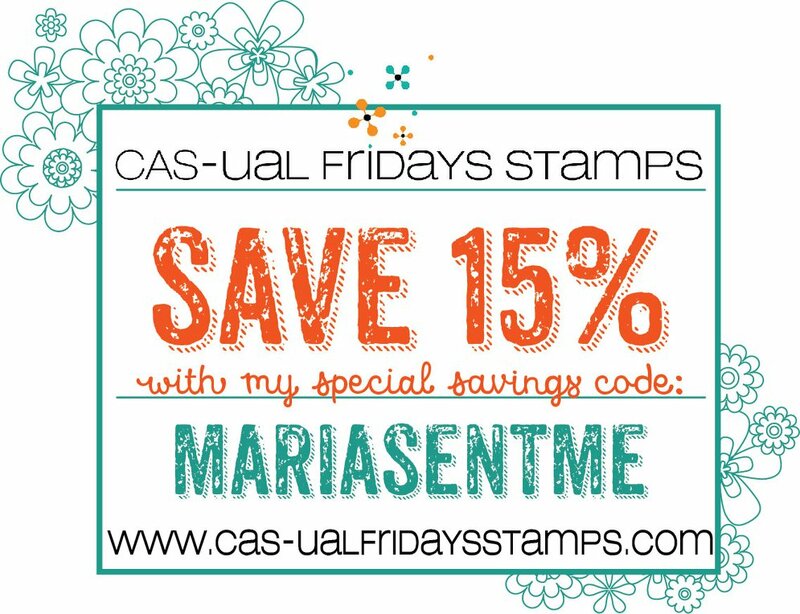 Please don't forget to use my coupon code "MARIASENTME" for 15% off your order. 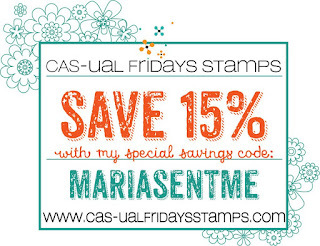 For further information including other supplies used, please visit my blog (www.mariarusselldesigns.com). 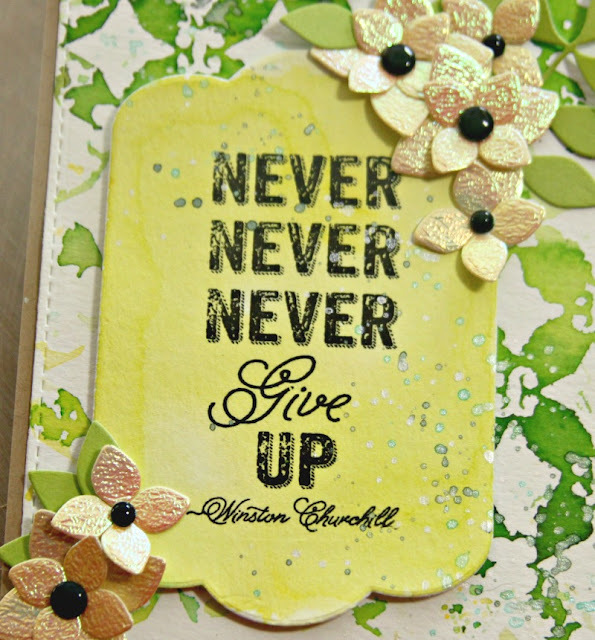 I hope you have an amazing day, and happy crafting! 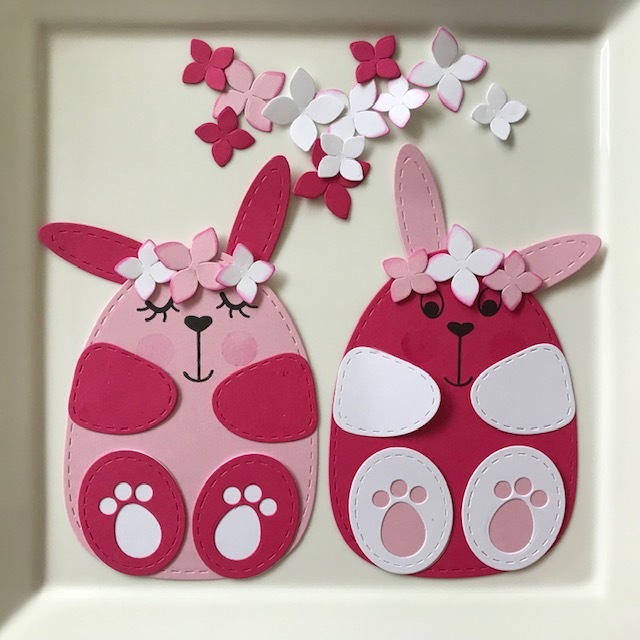 Hello it's Michelle from Seashell Creations here today sharing some cute bunny projects I made for Easter. I started by pulling out some different shades of pink and some white card stock and got to it with my die cutting machine. 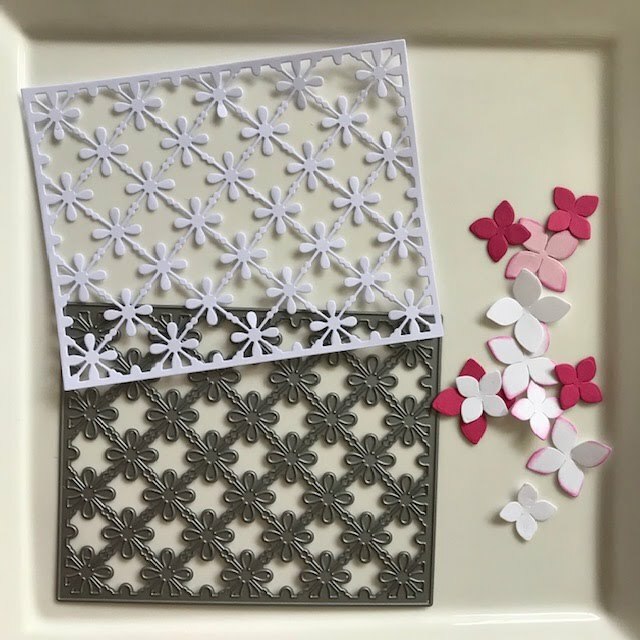 I also die cut some flowers using the 4 Petals Fri-dies. 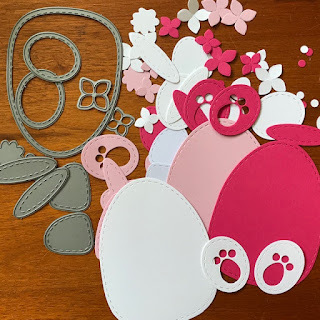 After playing around with different color combinations, I glued all the pieces in place and decided to make a card out of one of the bunnies and a gift bag out of the other. 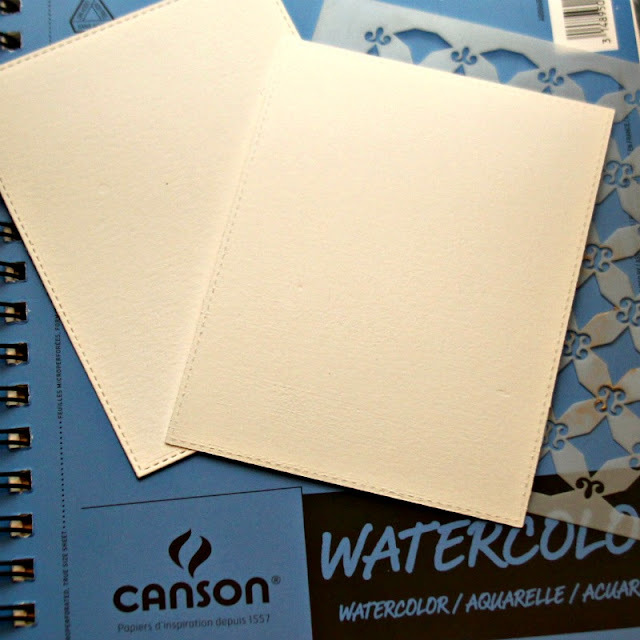 I die cut the Tin Roof cover Fri-die from some white card stock and glued it onto a white card base. I adhered the other bunny with foam tape directly onto a white gift bag and filled it with Easter eggs. Hi everyone and hope your all having a fantastic week!! Autumn/Winter weather is slowly creeping into my town in New Zealand and then all of a sudden we have a really hot day, so no wonder people are starting to come down with colds and flu's...luckily not our family so far (touch wood!). I'm still having a lot of fun with the products from last months New Release, just loving all the different dies and giving my Cuttlebug a run for its money!! 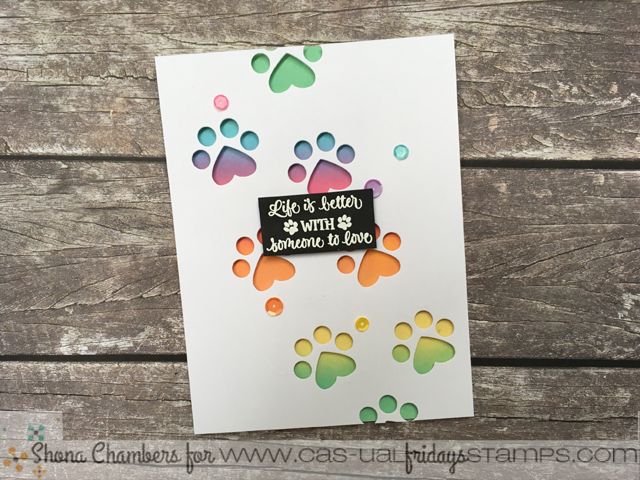 I wanted it to be simple, modern and colourful so that the paw prints would be the real star of the card. You can pop over to my blog to find out how I put this together!! I hope this has given you some ideas on how to use some of your smaller dies and I'll see you back here later in the month with some more die-cutting ideas!! Hi all, it's Vicki here today from All I Do Is Stamp. I hope you enjoyed last week's release. 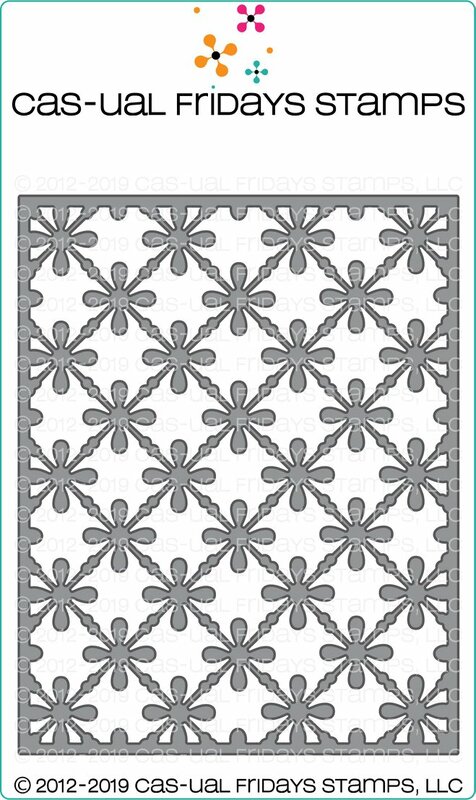 Today is another example using one of the new products. 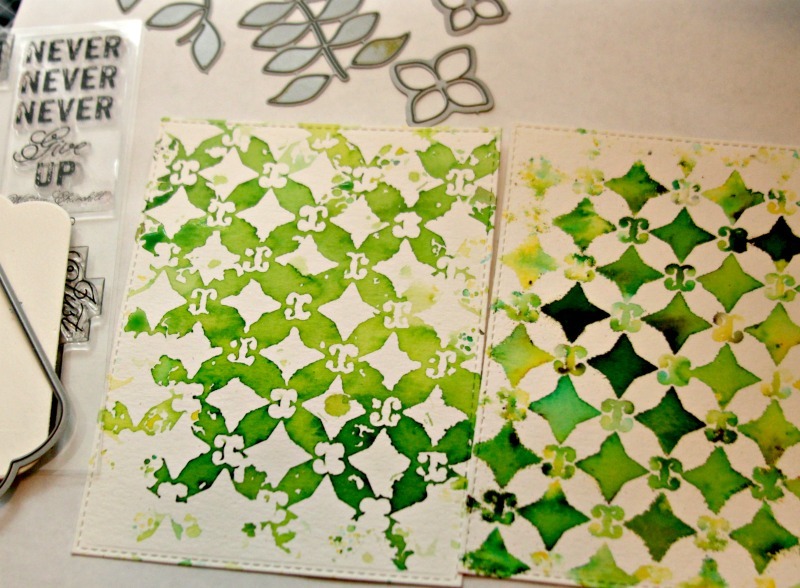 I started by making an alcohol inked panel, and built my card from there. 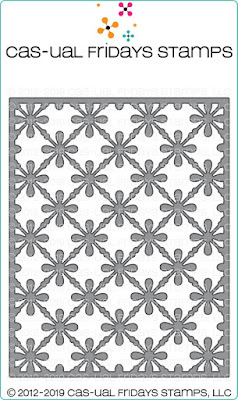 For the middle panel, I used the new Modern Petals Stencil. I laid the stencil over a piece of water color paper, and spritz'd it with some spray ink. Once it dried, I cut out the shape. 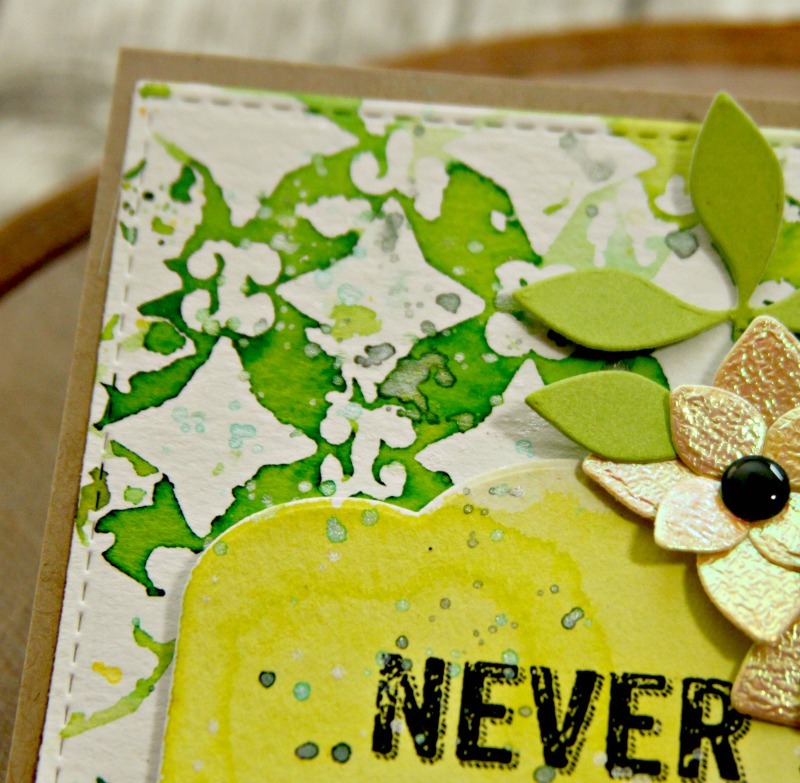 Using my MISTI, I stamped a sentiment from Bold Wishes. For my final step, I cut out the Friend Fri Die 3 times, adhered it together, and sponged on some ink. [I really love the look of sponged words.] I also cut out 1 in black and adhered it on for a shadow effect. Overall, I am very happy with this card. 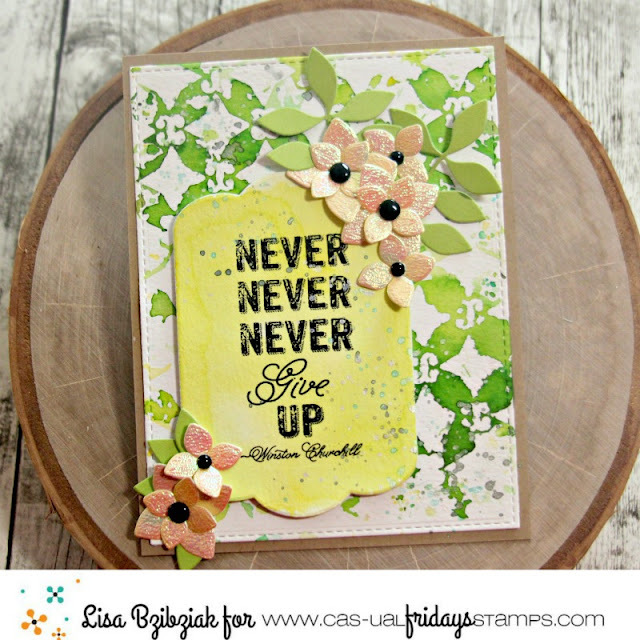 I love the contrasting colors together, and of course, I adore the Friend Fri Die with its great font. That's it for me today. 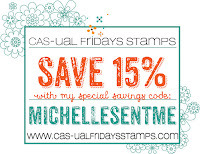 Remember, you can save 15% off any purchase from CFS by using my code!